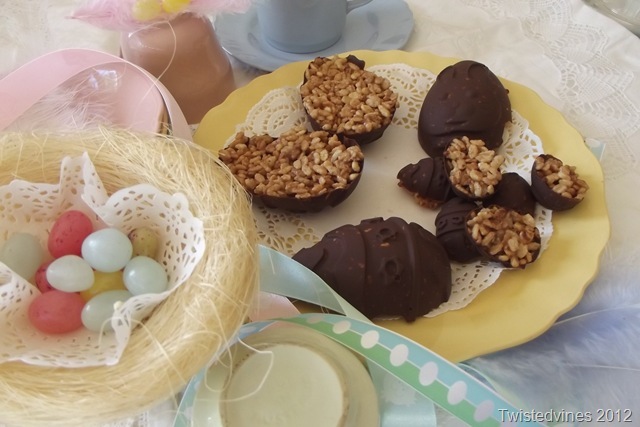 What better way to spend the afternoon with the warm sunlight reflecting off the windows, and surrounded by pastels, feathers, eggs, nests and mouth watering chocolate sweets. I found this old English china, not your usual fine, elegant designs and motifs. Plain, no designs, no gold trims, no embossing, just plain, hardly any markings.J EG. Meakin Glamour Celeste, Glamour Jade. But I couldn’t resist taking a few photos and making the cups and sauces, plates and bowls come alive with radiant pastel colours and charm. Perfect for an afternoon tea. 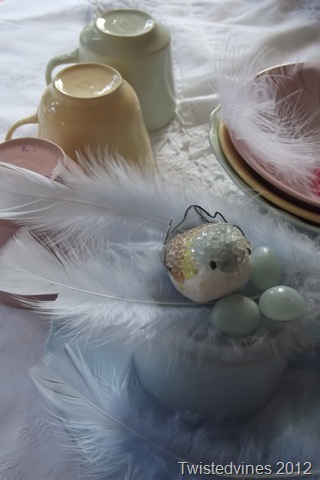 What better way then to celebrate Easter with all these soft pastel colours. 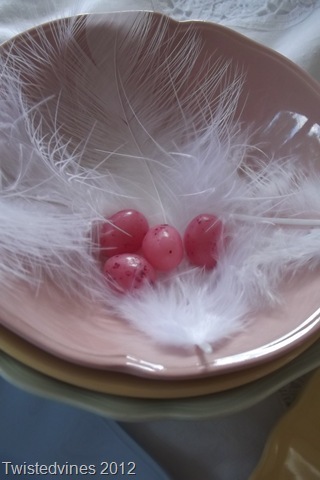 Egg Blue, Sunshine Yellow, Fairy Floss pink and Glamour jade. But to me they are all treasures, just because of their pastel colours. 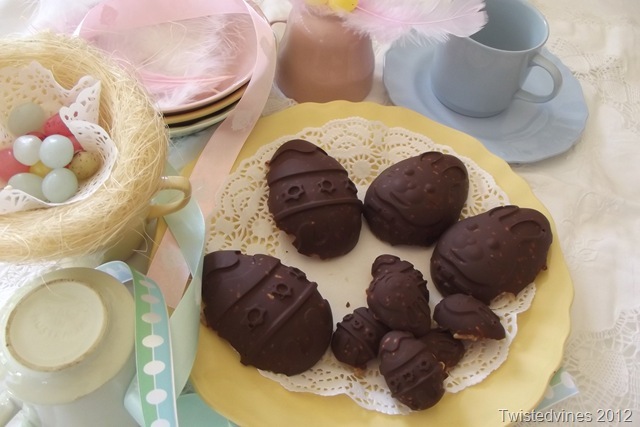 The plates and cups blend into a beautiful calm and playful group of colour – p a s t e l s.
Another special treat for Easter, chocolate coated bunnies. 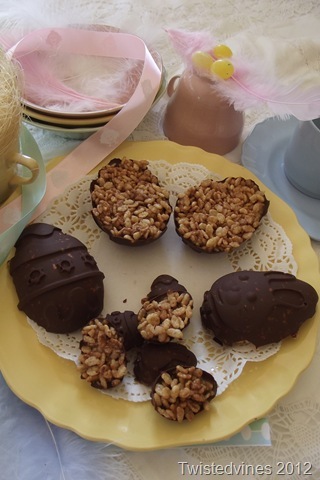 This recipe is so much fun, just for the little ones. Another easy recipe for Mum to make and the children will love helping with this one. This is a recipe someone from adult to child in my family usually makes on a regular basis as a slice for the lunchboxes. 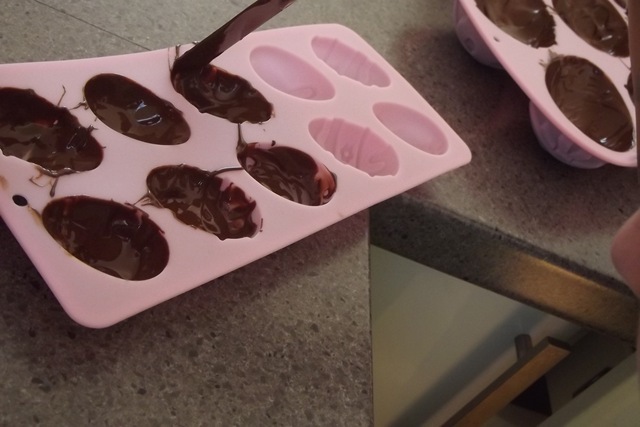 But as I had bought some new silicone molds for Easter I though we might try it out and see how they turned out. What a surprise! 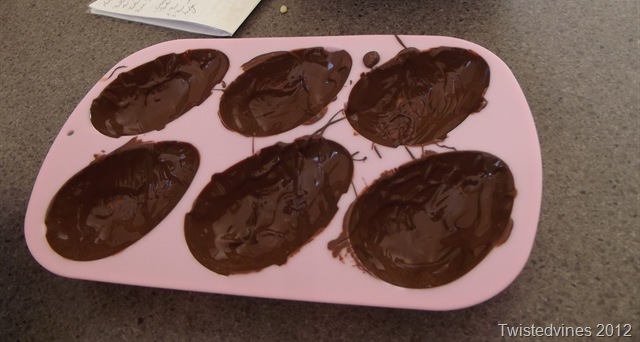 Don’t they look great for Easter… First of all melt a packet 250g of Milk Chocolate Buttons, and paint with chocolate inside the mold, be sure to cover all the surface of the mold in chocolate. It’s not necessary to do two coats, I like the textured effect of seeing the rice bubbles. Recipe: Rice Bubble Mars Bar Slice. Another afternoon baking with my niece,and another perfect afternoon tea ….perfect in P A S T E L S.
I would love to have been there baking and having tea with you and your niece, so lovely Yvette. Oh, Mandy you could have joined in the laughter…melting chocolate and painting molds with my neice was an adventure. Cropping photos helps, we had chocolate from elbow to face, and of course the childsplay of ‘cleaning’ the bowl. All fun! Sweet pastels are perfect for spring and Easter. Lovely post and the goodies look yummy, too! Happy Spring! Happy Easter! Happy Tea Day! The images in this series of posts, Yvette, have been very beautiful. The colors and subject matter all say renewal, rebirth, Spring, Easter. These visuals have framed your treats quite well, and today’s post is no exception. Such a pleasure to read! Thanks John, I’ve been enjoying the baking and having made more time this Easter to do a few extra things in the kitchen. These eggs don’t take very long at all, and the children always enjoy this rice bubble treat! Oh wow! 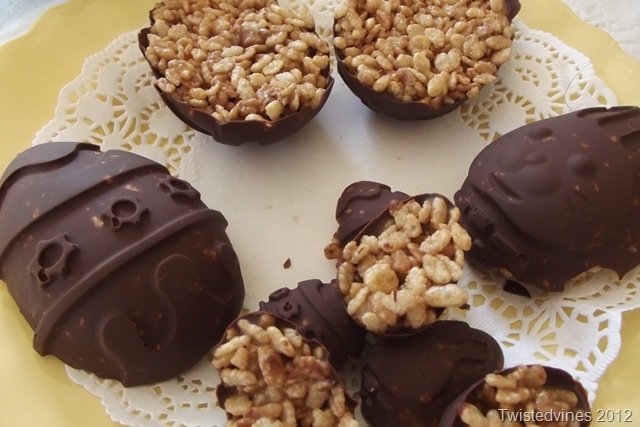 You really go all out for Easter with your home made chocolate eggs! They look wonderful! 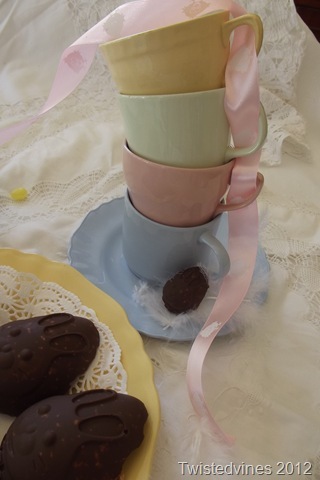 I think your pastel cups are a lovely find and perfect for your Easter setting with their beautiful pastel coloring. Thank you for your delicious post! Easter baking is so much fun and very creative with my niece and nephew at hand. It’s been busy in the kitchen for Easter baking.I too love these pastels! Happy Easter Yvette! I love the soft colours of the cups and saucers! Your chocolate eggs look really yummy! Kids of all ages would enjoy those! Thank you for joining me for tea. It’s been fun! Happy Easter Sandi, yes, a lot of fun this post.A true child’s play adventure cooking in the kitchen with my niece. thank you for your visit and the kind comment. Your soft pastel china is beautiful. I remember that this color combo was in the 60th very trendy. And now again! Perfect for the Easter time. Just love it. This china is really fun and I know I could use it more than one occasion..the pastels are ‘pretty’ and are fun for a pastel Spring Easter.My favourite the Glamour Celeste, it a blue egg colour! You just really have some amazing photos and recipes. I absolutely love the pastels and especially the china style – plain and simple. Great post! Glad you enjoyed your time with your niece. I’m sure she enjoyed it with you! What a great time and memory for you both! We had a wonderful afternoon together, it was an adventure! 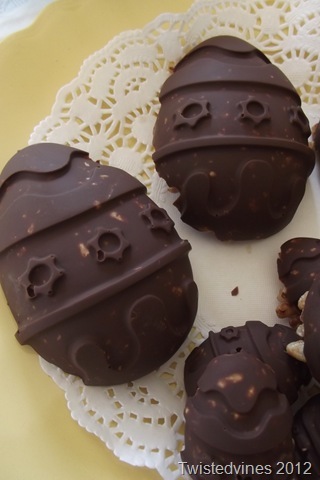 You create the most beautiful settings for the delicious-looking treats you make. Those pastel pieces are lovely. 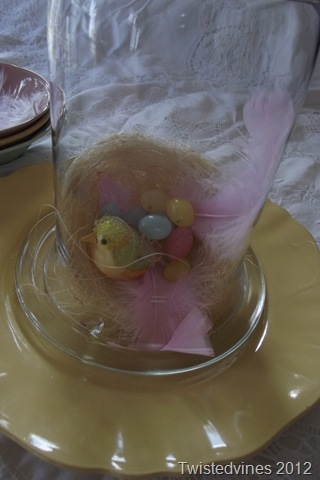 Yvette, I love the soothing, calm pastel colors, too…Oh, and the chocolate eggs look so yummy. Sweet Memories you now have! Lovely photos, story and recipe.